Welcome to the final installation of the second pullup progression in the BridgeAthletic Building Blocks series. The second version in our Pullup progression has brought you to the same place - Pullup mastery. Don't forget to show us what you've got. If you have followed the progression to this point, you are in a good place to perform pullups without any help. That said, if you have not, I would recomend referencing the rest of the progression, Day 1, Day 2, Day 3, Day 4, in order to best prepare for the pullup! Initially, it might be beneficial to stand on a box or bench under the pullup bar to help setup for each set. Place hands, knuckles up, just wider than shoulder-width on the pullup bar. In a controlled movement, pull your body toward the bar. Squeeze your elbows in to your side as you pull to get your chin above the bar. Pause. Slowly return to the start position. Pause. Without a big jerking movement, repeat the movement for the prescribed reps. Stretch your lats and shoulders in-between sets for best performance. 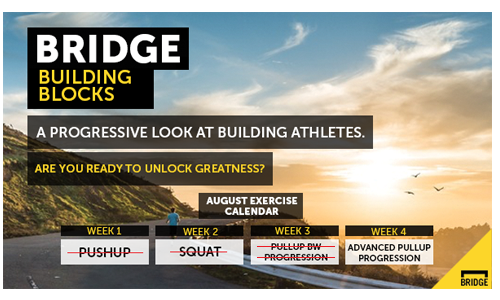 Be sure to check back next week for the next month of our Progression Series.